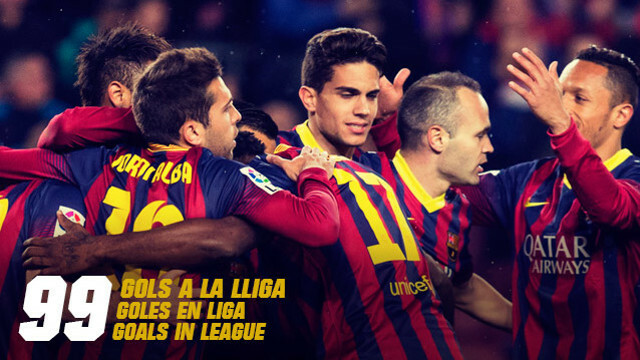 Will Barça hit the 100 goal mark vs Elche or Atletico? In 2013 it was Messi, who do you think will score it this time ? Barça are just one goal off hitting the hundred goal mark in the league again this season. With 99 goals in the 34 games so far played, Martino’s team need one more to reach 100 for the third season on the run, following last season’s record 115 and 114 the year before. Of the 99 goals, 61,6% have come from Messi, Alexis and Pedro, the team’s three leading scorers: the Argentinean has bagged 28 so far, with Alexis on 18 and Pedro 15 and all three are in the league’s top ten scorers table. In all 14 players have scored for Barça so far, with Neymar (9) and Cesc (8) leading the pack. There have also been three own goals, against Betis and Villarreal (2). With an average of 2,75 goals a game in the league, Barça have only failed to score on five occasions: against Osasuna(0-0), Atletico Bilbao(1-0), Atletico Madrid(0-0), Valladolid (1-0) and Granada (1-0) and scored more than three goals in 13 matches, against Levante (7-0), Rayo (0-4), Real Sociedad (4-1), Valladolid (4-1), Betis (1-4), Granada (4-0), Getafe (2-5), Elche (4-0), Seville (1-4), Rayo (6-0), Almeria (4-1), Osasuna (7-0) and Reial Madrid (3-4). Will Barça hit the hundred goal mark against Elche or Atletico? Who do you think will get the hundredth goal? Last year it was Messi and two years ago Cesc.